DesignContest Blog Color and Emotion: How Do You Choose Colors? Color is one of the most important and influential branding tools available to you. It can set the mood for your company’s website, logo and brand. Color can help you connect with customers or cause them to turn away. And it is all based on emotion. Consider this: The world’s most recognizable brands and logos can be grouped into a handful of categories based on the primary color they use. 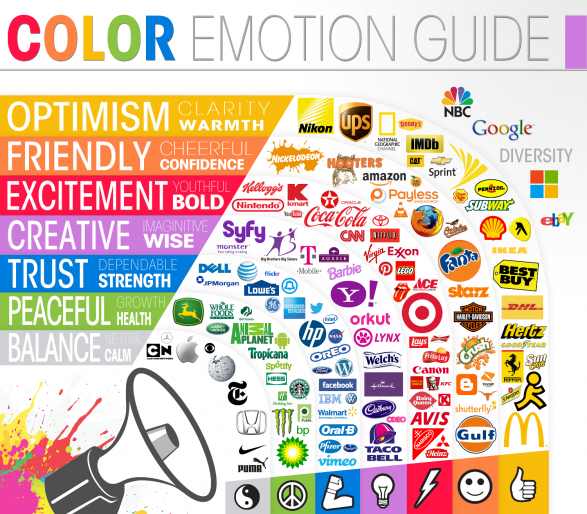 And those colors translate to how people feel about and perceive a company. Here’s a primer on color and emotion based on this infographic showcasing world brands and their color choices. If you want to be associated with happiness and sunshine, yellow is your go-to color. Brighter sunnier yellows are the happiest hues. While more golden yellows are thought to be richer. Yellow is thought to be a fast color as well and often implies some sort of movement. But more than anything else, yellow is the color of optimism. This is not the color for a project that is depressing or unhappy. When it comes to yellow, the color works best as a shape or background to text or another icon. Think to the yellow tag used as the Best Buy logo or the iconic National Geography rectangle. Orange is a popular color for brands related to fun. The color exudes a warmth and friendliness that brands such as Nickelodeon and Crush soda have built on for years. The color is also cheerful and confident – think about how those descriptors apply to companies like Hooters and Harley-Davidson. Darker, more rust-colored oranges lose some of these associations, while lighter tones exaggerate them further. Red is the color of excitement. It is one of the most popular brand colors and is iconic of some of the top companies around the world. Coca-Cola, Target, CNN and Pinterest all contain distinctly red logos. The exuberance of this color makes it stand out and connects with people instantly. While the color can be seen as unstable, it is generally something people can relate to. Red is also a popular choice among food manufacturers since the bold color is thought to help stimulate the appetite. Kellogg’s, Nabisco and Heinz all use red to help steer customers into buying their tasty offerings. Darker reds are more bold and daring. Lighter reds and even pink are softer and comforting. It has long been thought that purple was somewhat of an unstable color and is often loved or hated. The most notable big brand using purple is Yahoo. The company though is careful to use the color as an accent and for logos rather than to create an over-the-top purple website. Other purple associations are tied to history. Wisdom, for example, goes back to the idea of royalty knowing all and wearing purple robes. The darkest purples are considered the most creative or regal, while lighter hues are seen as more imaginative and fun. The most universally accepted color emotionally is blue. The color of dependability, trust and strength is used by businesses of all kinds. Banks, retailers and auto makers rely on the color to make customers feel at ease. Healthcare companies also rely heavily on blue to gain the trust of patients and put them at ease. Darker blues feel more solid and trustworthy, while lighter blue loses some of those associations while maintaining feelings of dependability. There’s nothing more soothing and calming than taking a walk. That’s the emotional connection you get when you see green – the color of nature. So it makes perfect sense that companies like Whole Foods, John Deere and Animal Planet use the color as a dominant hue in their logo and branding materials. It’s also of interest that green is also a popular color for gas and oil distributors, such as BP and Hess. Green has also come to associate with some tech-based business as well – no doubt that the emotional connection to growth is an undercurrent. Android and Spotify both use bright greens. While there is quite a large spectrum of green hues, the emotional connections are fairly consistent. It is worthwhile to note that lime green is very trendy and has been called the new neutral, and is being used with a variety of other colors. Gray is one of the most common, and popular, neutral tones. It works best with some other use of color but can stand alone. Apple has one of the most noted gray logos around. Auto makers often use gray, or silver, as well. The neutral color emits feelings of calm and balance. The thing you have to be wary of is that gray can sometimes be seen as boring. Light grays can dip down almost to white, while darker grays may look black. While most of the examples here rely on a single color choice, combining colors creates emotional connections as well. Use red and yellow together for a bold, warm association. Also understand that emotional attachments to color can vary from person to person and even culturally. And further complicating matters can be color-blindness, which prevents people from seeing some or all color. As with any design project, test the design. Play with the color. Test some more. And decide on a final choice only after you are confident customers or users are getting the message you want to send from your design choice.